Millions of Americans are concerned over the threat of radical, Islamic terrorism. But all too often they are unaware of other attempts by Islamists at transforming their country into a Muslim state. While terrorists try to submit the West to Islam through violence, Islamist are far more subtle. They want to use our very laws and customs to promote Islamic law—whether you want it or not. For years Islamists have abused America’s religious rights to give Muslims priority in communities, schools, and institutions. But now we’ve discovered they’ve devised an even more insidious scheme to make American food Sharia compliant. Kirralie discusses Promoting Sharia With Your Grocery Purchases, unveiling how Islamic Supremacism is being funded with your shopping. 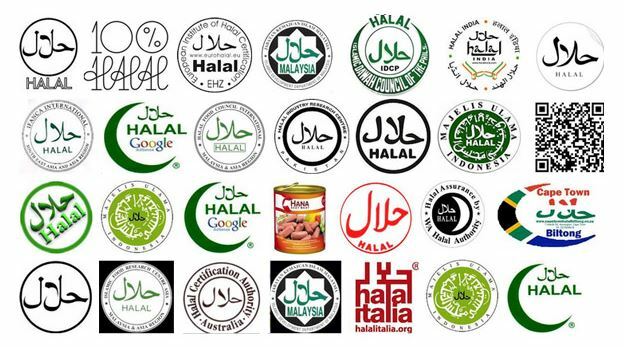 The video reveals that Islamic groups have convinced many food companies to make their foods halal. They even charge huge fees in order to ensure items from chocolate to cereal meet their standards. By buying these products, you are unwittingly funding a shift from Western values to Islamic ones. In October 2010, news broke about how the Campbell’s Soup company received an Islamic (halal) certification for some of its product line, and many were outraged. There was a legitimate concern – not with the fact that Campbell’s received the certification, but with what organization the certification came from, that being the Islamic Society of North America (ISNA), a group co-founded by Palestinian Islamic Jihad (PIJ) leader Sami al-Arian. In 2007 and 2008, ISNA was named by the U.S. Justice Department as a co-conspirator for two federal trials dealing with the financing of millions of dollars to Hamas. The defendants of the trials were the leaders of the Holy Land Foundation for Relief and Development (HLF) and HLF itself. In the end, each was found guilty of all charges. The trend to acquiesce to Muslim dietary demands has spread to virtually all major food and restaurant companies. This is not simply an effort to make cash off of Muslims; it is quite possibly a way for Islamists to force all Americans to bend to their demands. The companies include KFC, Whole Foods, Publix, and Costco. What’s next? Will bacon and alcohol be banned from restaurants? Will good, American traditions be torched in the name of Sharia law? To learn which companies are complying with Islamist demands, visit Bare Naked Islam’s page as well as this page at Zabinah, or look below as Zabinah’s list of grocery stores. Restaurants also include certain locations of the following: KFC, Sliver Diner, Masala Wok, Popeye’s, Outback Steakhouse, Wayback Burgers, Dimassi’s, and Subway. …not only Campbell’s soups, but Ben and Jerry’s ice cream, Sun-Maid raisins, Nestle chocolate, and according to the bio of IFANCA’s President Muhammad Munir Chaudry, Hershey and Pepsi too.